Hello! I hope you are having a wonderful day with your friends/family! I wanted to pop in really quick and share the place cards I made using my PTI Friendship Jar set and dies. The sentiment comes from the PTI set Fall Elegance. So what are your plans today? Who is going shopping tonight and who is waiting until tomorrow? My BFF (that I shop with every year), my mom, and I have decided to head out tonight because my friend really wants to go to Toys R Us. After that we'll hit one of the malls that is opening at midnight. I'm much more of a night owl than a morning person, so I think this schedule may work, although I still think they've really messed up Thanksgiving and Black Friday with these 8 p.m. openings. I liked it so much better when everything opened at 6 a.m.! Have a wonderful, relaxing, delicious Thanksgiving! you. are. so. brave Kerri! I stayed in. 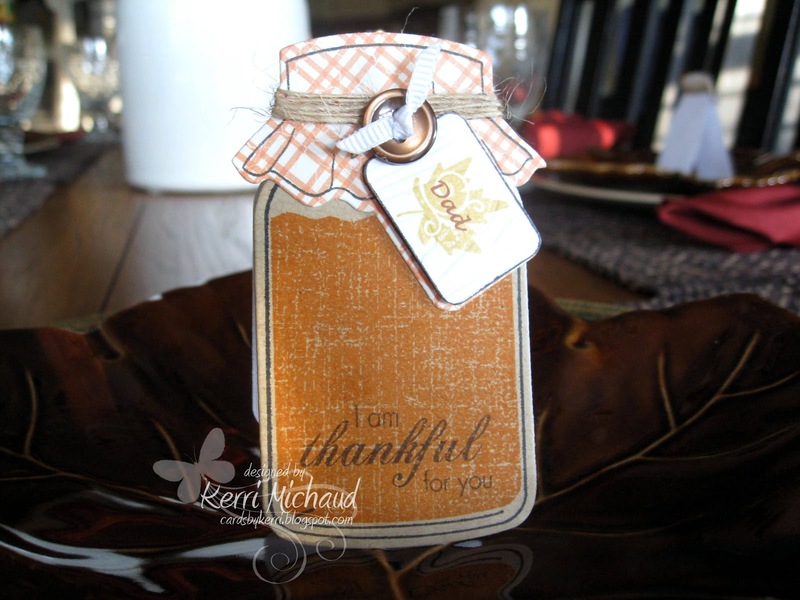 I love this place card~great idea!